Artist Samuel Price is a collaging machine. 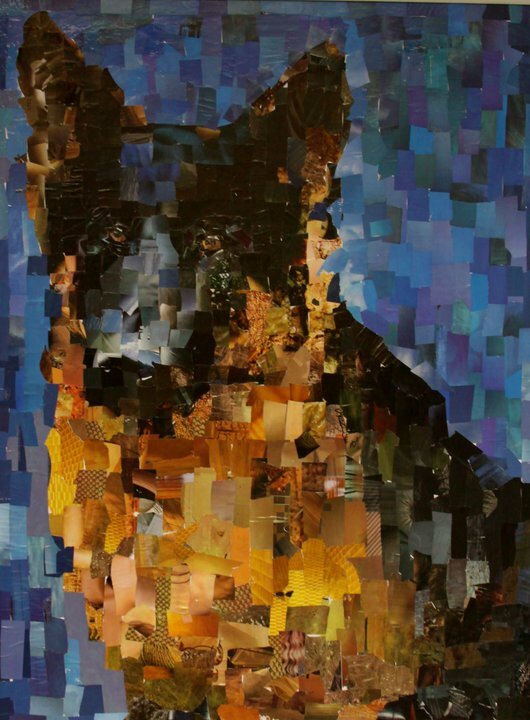 He creates one of a kind dog portraits using hundreds of hand-cut recycled magazine squares on canvas, working (and he says the following are when he works conservatively) five days a week using at least 20 recycled magazines a day. That’s 100 magazines a week, 400 a month, 4800 a year, and 48,000 in ten years. Using those calculations, Price figures he’s saved at least 650 trees, all the while making cool and thoughtful gifts for the green dog lover who has everything. Artist Samuel Price is a collaging machine. He creates one of a kind dog portraits using hundreds of hand-cut recycled magazine squares on canvas, working (and he says the following are when he works conservatively) five days a week using at least 20 recycled magazines a day. That’s 100 magazines a week, 400 a month, 4800 a year, and 48,000 in ten years. Using those calculations, Price figures he's saved at least 650 trees, all the while making cool and thoughtful gifts for the green dog lover who has everything.